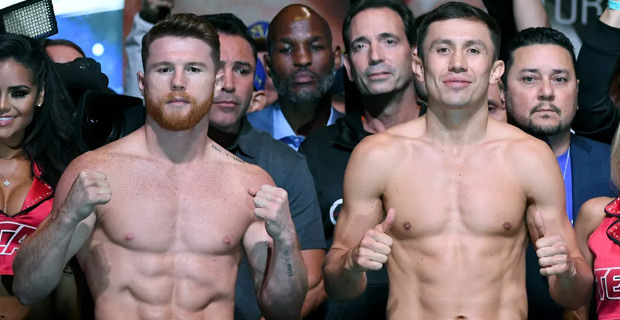 The 18,000 seating capacity T-Mobile Arena in Las Vegas has sold out for the fight of the century between Gennady Golovkin and Canelo Alvarez. The rematch has been called one that will be "remembered for the ages" and "the biggest in the sport of boxing" with ticket prices ranging from $640 to $10,660. 364 days after their controversial draw at the same venue ‑ gives Golovkin, a chance to set a record 21 world‑title defences in the middleweight division if he retains his WBC and WBA belts. Mexican support will descend on the Nevada desert venue to cheer on Alvarez on what is the nation's independence celebrations weekend. The bout between Gennady Golovkin and Canelo Alvarez will begin at 12pm Sunday.